Have You Had a Skellig Experience? My sister Rachel came to visit for a week over Easter. Unfortunatley the real Skellig experience - actually visiting Skellig Michael - is not possible at this time of year as the boats don't yet operate due to the weather. 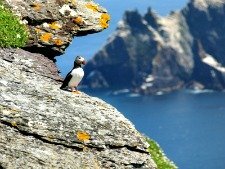 Skellig Michael boat trips run between April and October. However, this was the rare occasion that she left her windsurf gear at home so this was my chance to act as tour guide and show her all the best parts of the Ring of Kerry. Top of my list was the Skellig Ring coastal drive - a magnificent loop drive connecting Valentia Island, Portmagee and Ballinskelligs. 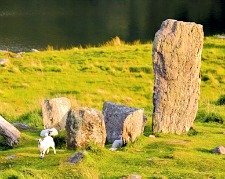 This drive or cycle should be on everyone's list of 'things to do’ in County Kerry. Our main priority was to be at the artisan Skelligs Chocolate Factory in St Finian's Bay by late morning as we wanted to enjoy the ocean views with chocolates in one hand and a warm flask of tea in the other! 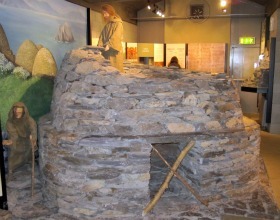 With plenty of time on our hands we first visited the Skelligs Heritage Centre. Directions - Cross the bridge at Portmagee onto Valentia Island and it is immediately on the left. The centre is situated overlooking the beautiful inlet separating Valentia Island from the mainland. The stone clad exterior topped with a turf roof looks great and has clearly been built to mimic the tough conditions found out on the Skellig Rocks. Inside, models and displays explain how early chrisitan monks established and maintained a monastic settlement high up on the cliffs of Skellig Michael. There is also a good short film about the Skelligs shown in the auditorium. just a tiny speck in the wild Atlantic Ocean. This is certainly a place which helps put life into perspective. There are also fascinating displays about the bird colonies inhabiting Little Skellig Island & plenty of photographs which showcase the Skelligs as a world class diving site. 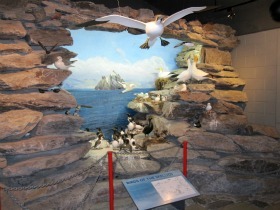 I had previously avoided the Skellig Experience visitor centre as nothing can compare to visiting the real thing. However, both Rachel and I enjoyed it. For five euros per person it is well worth visiting especially if you haven’t time to take the boat trip.